Although this popular, aromatic spice has been used for centuries in many cuisines around the world, not many people know that cinnamon can prevent plaque build-up. Its strong anti-microbial properties are an effective weapon against plaque-building organisms thriving in the mouth and causing bad breath. 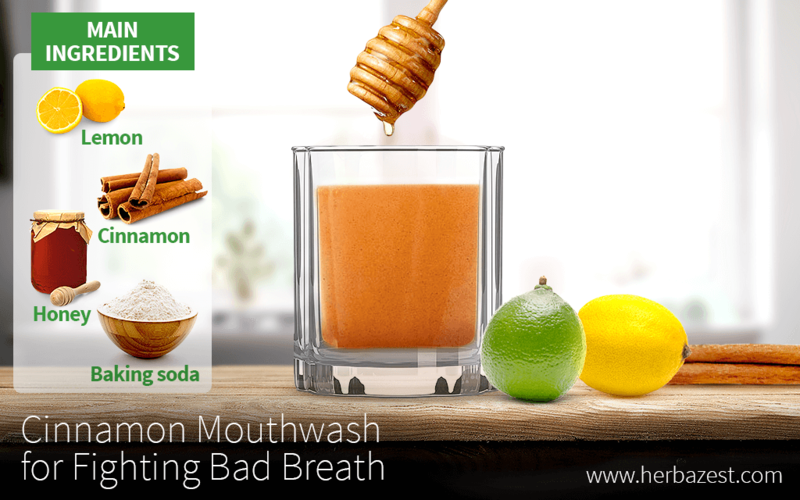 With the help of citrusy lemon and anti-bacterial honey, this cinnamon mouthwash will prevent gum and teeth disease, rid of odor, and ensure oral freshness all day long. Store this anti-plaque cinnamon mouthwash at room temperature. To use it, shake the bottle, take a sip, and thoroughly swirl the mixture in the mouth for 30 seconds to a minute. Use twice a day for best results or as desired throughout the day to refresh the oral cavity.